Yeshiva University’s annual Tekes Ma’avar, the roller coaster commemoration of Yom Hazikaron, Israel’s somber Memorial Day, transforming at night into a joyous celebration of Yom Ha’atzmaut, Israel’s Independence Day, took on an added poignancy this year with Torah classes on Israel-related topics dedicated to the memory of Rav Aharon Lichtenstein zt”l, who passed away earlier this week. Hundreds of students packed the Lamport Auditorium Wednesday night, April 22, with an atmosphere of mournful yet anticipatory tension at the start of the student-organized event. A screen displayed photos of soldiers fallen in this past summer’s war in Gaza. A siren sounded and the Israeli flag was lowered. Rabbi Kenneth Brander, vice president for university and community life, shared his experience as a parent of an Israeli soldier, and was followed by Ethan Gipsman and Daniel Gofine, two current students who served in the Israeli Defense Forces (IDF) and members of YU’s Soldiers in Exile Club. Gofine described the selflessness of an officer he knew who was killed in Gaza and the officer’s constant refrain of the reason to fight for Israel: we have no other land. After the lighting of a memorial candle, the Y-Studs a cappela group performed a musical tribute, Rabbi Yosef Blau, senior mashgiach ruchani at Rabbi Isaac Elchanan Theological Seminary, recited a Kel Maale – memorial prayer for fallen soldiers, and Rabbi Yosef Kalinsky, assistant dean of undergraduate Torah studies, said the prayer for members of the IDF. The flag was then raised as the program transitioned to Yom Ha’atzmaut. 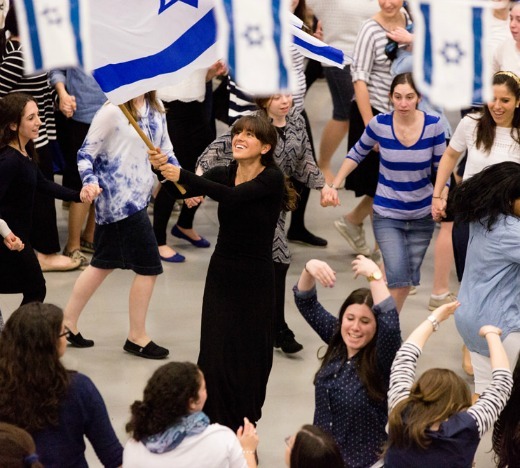 After prayers and the blowing of a shofar, students proceeded to the Max Stern Athletic Center for music, dancing and food. Festivities continued on Thursday with special Yom Ha’atzmaut programming scheduled throughout the day.